The EVERLINE® LED Professional Retrofit Kit (PRK) family of pre-mounted and pre-wired LED retrofit kits are fast and easy to install in recessed fluorescent fixture retrofits. The PRK kits are available in multiple lumen and color temperature configurations, all with 80+ CRI. Not only does the PRK provide the energy efficiency of LED, it’s also a great option to refresh the look of an older fixture. 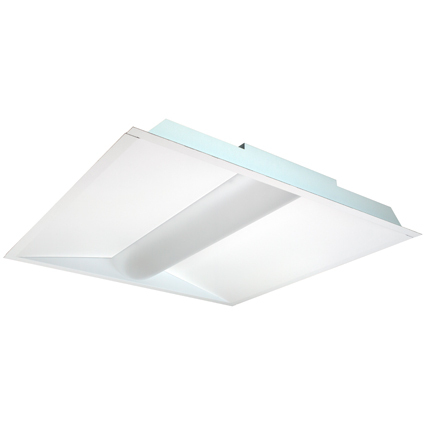 Its low loss frosted acrylic center-basket style diffuser paired with corrosion and scratch resistant white enamel finished steel panels provide end users with the look of a new pan-style fixture. Contractors benefit from the PRK’s ease of installation and labor cost savings of retrofitting instead of replacing an existing unit. In addition, the PRK comes standard with 0-10V dimmable driver and high-efficiency modules.